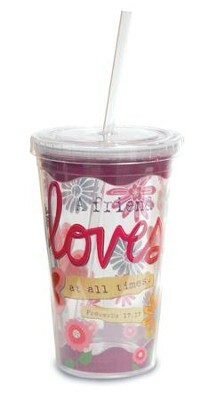 Inspired Grace cup with straw in vibrant color and bright design; 16 ounce cup, double-walled to keep cold drinks from condensation. 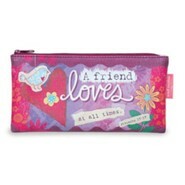 Screw-on lid; practical, reusable; wrap around Scripture and artwork. 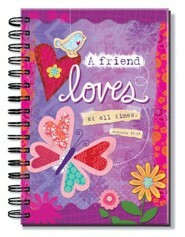 Not recommended for microwave or dishwasher.Whimsical butterfly design in bright happy colors; collage motif with Scripture quote from Proverbs 17:17 A friend loves at all times. Inspired Grace Collection. I'm the author/artist and I want to review A Friend Loves, Tumbler.